Mary Ellen is not only a talented poet, but a woman of great spiritual and humanitarian strength who knows how to reach often marginalized students. She's the real thing and brings to the table a way and a presence, a special touch, which I can only term a calling, a gift, a kind of magic. A woman of indisputable mettle with a generous spirit of shared purpose and joint humanity that her writing and her very life embodies. Group spaces offer powerful witness. Toni Morrison says that language creates us at the very moment it is being created. 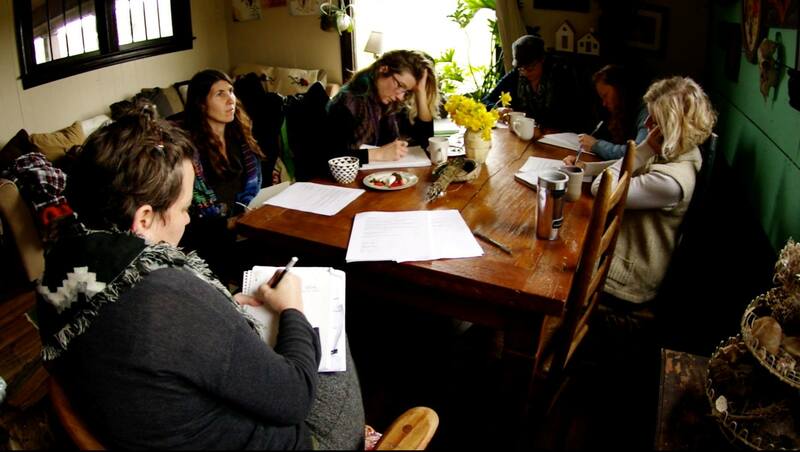 Poetic Medicine workshops are safe spaces in which we explore the boundaries of the self and the stories and truths that might liberate us. Workshops are a form of self-nurturing, rich sharing, and allowing the nuance of your inner landscape to unfold visibly on the page. No experience is necessary. Whether you are a stay-at-home mother, retired engineer, or combat veteran, there are workshops for you. Poetry as Healer is not High School English. It is a form of soul recovery. Of finding what you haven't lost. It offers a path of mystery and beauty through the inner landscape. Our bodies are oracles of an animate earth and our most important images live inside us already. Poetry is the bucket which we lower into the depths, and draw back up to examine what resides out of conscious sight. Tight on Time and Money? For as little as $1/month, you can join me on Patreon and receive poems, inspiration, writing prompts, and insights from my teaching. For a little bit more monthly, you can participate on online forums, monthly workshops and get weekly emails.